The pone book is a directory of numbers and associated names saved permanently. Clicking the right mouse button a context menu appears. You can create and deletethere entries. Clicking a bit longer with the left mouse button, you enter the edit mode and can change the selected text..
Drag&Drop the entry into the area called "actual calls"
The last column "comment" is a simple comment field - you can put there text like "private" or "busy". There is one exception: If you put in this field an URL (http://...), a web site will be displayed for a call from/to this phone book number. The Internet-Explorer is used as backend. HTTP and HTTPS addresses are supported. One scenario would be video based door line support (e.g. a video URL like http://www.webcam-baden-baden.de/ltur.mjpg). After call termination the display of the web site or video will be closed. 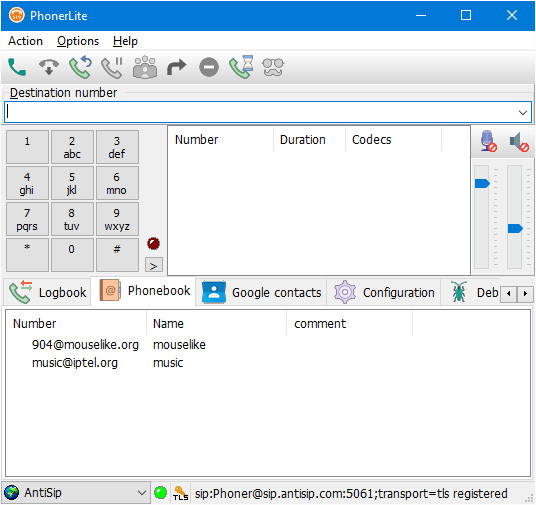 The content of the phone book is saved in the file called "phonebook.csv". It contains pure text, so it can be edited with any editor.